Today’s teenagers are starving for “more of Jesus”—not just more information, but a deeper, richer, truer encounter of him. LIVE Jesus-Centered Life unlocks the door to deeper conversations and explorations that satisfy this hunger. Today’s teenagers are starving for more of Jesus—not just more information, but a deeper, richer, truer encounter with him. LIVE™ Jesus-Centered Life unlocks the door to deeper conversations and explorations that satisfy this hunger. Students will spend six weeks exploring their answer to a pivotal question Jesus asked his disciples in Luke 9:22—“Who do you say I am?” Without personally considering that question, we can miss who Jesus really is. Each lesson offers a snapshot of Jesus that will help students be reintroduced to him and follow him more sincerely. Instead of just seeking head knowledge, participants will engage their hearts through experiential elements and honest dialogue. Maximize Impact: Intentionally help young people experience who Jesus is so they can passionately pursue a Jesus-centered life. RICK LAWRENCE has been editor of Group Magazine since 1988 and serves as the “Youth Ministry Champion” at Group/Simply Youth Ministry. He’s the author, co-author, or editor of 34 books, including Jesus-Centered Youth Ministry and Skin in the Game. 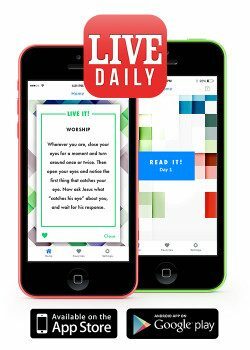 LIVE Jesus-Centered Life includes access to the innovative new LIVE Daily app that sends “in the moment” prompts and ideas for living out their faith. Each day’s idea taps into different ways that people learn—through serving others, reading Scripture, tackling questions, looking toward Jesus, and worshipping in ways beyond singing songs. "I choose this item because it is something we should be teaching our youth. I love the LIVE curriculum because the lessons lead to great conversations among my youth."